23 educational garden activities to build a Children’s Garden in your own Backyard! We look forward to gardening with the kids each year. As soon as the weather begins to warm up we are planning our children’s garden for the year. Gardening with kids is so rewarding for the whole family! It is so wonderful to see the kids learning and growing right alongside their favorite fruits and vegetables. Gardening with kids is fun and educational for everyone involved. Our children’s garden preparations begin each year in February when we being our initial planning. The children each choose what they would like to plant for the year and we then start our seeds indoors. I prefer to start from seeds so that we can follow the plants entire lifecycle with them from seed, to sprout, to flower, to fruit. We keep the kids involved with our backyard vegetable garden even when the work is tough. They help pull the weeks, till the ground and spread the mulch. When it’s time to plant our seeds and sprouts they do that too! The best part about growing a children’s garden in your backyard is giving the children something they can feel proud of – when they see their plants begin to grow and flower they will be so amazed at the fruits of their labor. To get you started on your own children’s garden, we have 23 kids gardening activities to share with you. 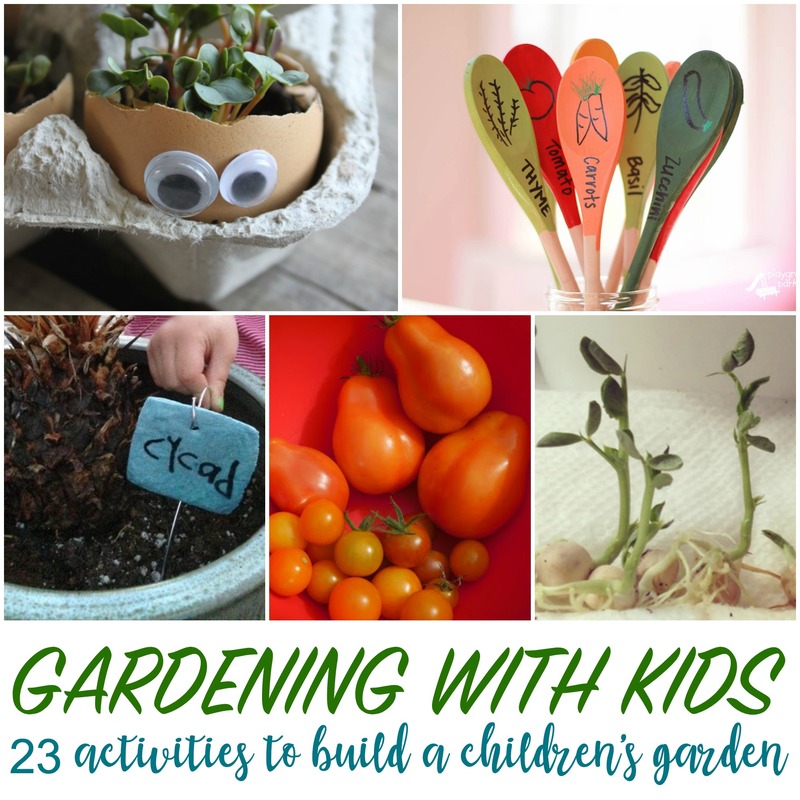 These activities for gardening with kids are so much fun and so educational. And and added bonus is the quality time you will be spending with them and the memories that well be made. There are many gardening activities that can be done inside as well as outside, and of course beautiful artwork the kids have made to add to your finished Children’s Garden. A Beginners Guide to Gardening with Kids is a great place to start. You will also want to check out this article on the importance of outdoor play and gardening with kids. If you are brand new to gardening then this article on how to begin gardening with kids in three easy steps is a must read! You can even introduce gardening to the little ones with these helpful tips from little house living. Planting an Organic garden with kids is a great idea, too, if you have special diets or health concerns. Check out this free easy reader book about gardening for kids too! We love this Easy 3-Step Indoor Herb Garden,perfect to keep on your kitchen counter or window sill. Once we have decided on our vegetables to plant for the year we start our seeds – using a few fun activities to do so. You can grow seeds in a plastic bag, make an adorable radish top egg head or a grass head, or my personal favorite – make a seed bomb! Keep it educational and teach the kids all about the plants they are growing with this plant science activity and keep a garden journal as you watch your plants grow. Once you have your seeds and sprouts planted you’re going to want a way to identify them. Get this kids involved by making Kid Made Garden Signs. Use inexpensive wooden spoons to make a fun garden craft or paint them to make wooden spoon garden markers. Another fun idea are these beaded garden markers. Make your children’s garden an inviting place they will want to visit and play in each day. I love using the plants to accomplish this, like building a sunflower house. You can also add an easy backyard fort. Both of these make a great place to read on a spring or summer afternoon. Let the kids decorate their garden with a clay pot resist art sculpture or beaded garden ornaments. A super fun way to build a backyard garden is to give a theme. A couple of easy ideas are a taco or pizza garden. When you grow a themed garden you choose all the vegetables you would need to make that specific dinner. We do Pizza Fridays around here so a pizza garden would be awesome! The kids can pick the vegetables and watch them go straight from farm to table for their dinner. Be sure to keep your garden fed, too! Make an easy DIY compost bin to hold your fertilizer.